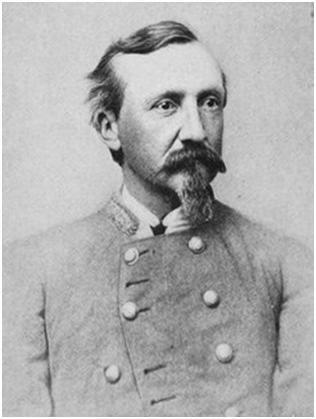 Walter Husted Stevens (August 24, 1827 - November 12, 1867) was a Confederate army brigadier general during the American Civil War. He graduated from the US Military Academy at West Point, New York, and served in the Corps of Engineers, mostly in Louisiana and Texas. He was an engineer for the Army of Northern Virginia. He was reputed to be the last uniformed man to cross the Mayo Bridge during the evacuation of Richmond, Virginia, after the Confederate defenses of Petersburg, Virginia, collapsed on April 2, 1865. After the Civil War, Stevens became the superintendent and engineer of the Mexican Imperial Railroad. He died of yellow fever at Vera Cruz, Mexico, on November 12, 1867. Walter H. Stevens was born August 24, 1827 at Penn Yan, New York. Stevens graduated from the US Military Academy at West Point, New York, fourth in his class of thirty-eight in 1848. He was assigned to the Corps of Engineers as a brevet second lieutenant on July 1, 1848. He was appointed a fullgrade second lieutenant on May 28, 1853, and a first lieutenant on July 1, 1855. Steven's Southern sympathy is explained by his Corps of Engineers' service, mainly in Louisiana and Texas, and his marriage to a sister of Confederate Brig. Gen. Louis Hebert. Stevens offered his resignation from the US Army on March 2, 1861, when Texas passed its ordinance of secession, but it was refused and he was dismissed from the service on a technicality on May 2, 1861. Meanwhile, on March 16, 1861, Stevens had been appointed a captain of engineers in the Confederate Army. Walter H. Stevens was immediately promoted to major in the Confederate army on March 16, 1861. He was assigned as engineer for the army at Pensacola, Florida, in April 1861. Between June 1861 and June 1, 1862, he was assigned as engineer in the Confederate Army of the Potomac and, after its change of name, the Army of Northern Virginia. In this capacity he served under Gen. P. G. T. Beauregard at the first battle of Bull Run (first Manassas) and under Gen. Joseph E. Johnston during the Peninsula campaign and the battle of Seven Pines. Stevens was promoted to lieutenant colonel on January 31, 1862. From June 1, 1862, to February 1864, Walter H. Stevens was assigned as engineer in the Department of Richmond, which he strengthened. He was promoted to colonel on March 3, 1863. He was assigned to the Defenses of Richmond, in the Department of Richmond, from February 1864 to July 20, 1864. On July 20, 1864, he returned as chief engineer to the Army of Northern Virginia and served with it through the Siege of Petersburg, strengthening the defenses of that city, and the Appomattox campaign. Stevens was promoted to brigadier general on August 28, 1864, under the law permitting Confederate President Jefferson Davis to appoint twenty special brigadier generals. Stevens was supposedly the last uniformed man to cross the Mayo Bridge at Richmond, Virginia, when the Confederate army and Confederate government evacuated Richmond on the night of April 2, 1865, after the fall of the defenses of Petersburg, Virginia, at the battle of Five Forks and the third battle of Petersburg. Stevens was paroled at Appomattox Court House on April 9, 1865. After the Civil War, Stevens went to Mexico where he was superintendent and engineer for the Mexican Imperial Railroad, a railroad line planned by Emperor Maximilian I of Mexico to run between Vera Cruz and Mexico City, Mexico. Walter H. Stevens died of yellow fever at Vera Cruz on November 12, 1867. Source of information: Boatner, Mark Mayo, III. The Civil War Dictionary. New York: McKay, 1988. ISBN 0-8129-1726-X. First published New York, McKay, 1959. Eicher, John H., and David J. Eicher. Civil War High Commands. Stanford, CA: Stanford University Press, 2001. Sifakis, Stewart. Who Was Who in the Civil War. New York: Facts on File, 1988. Warner, Ezra J. Generals in Gray: Lives of the Confederate Commanders. Baton Rouge: Louisiana State University Press, 1959. Wert, Jeffry D. "Stevens Walter Husted" in Historical Times Illustrated History of the Civil War, edited by Patricia L. Faust. New York: Harper & Row, 1986.